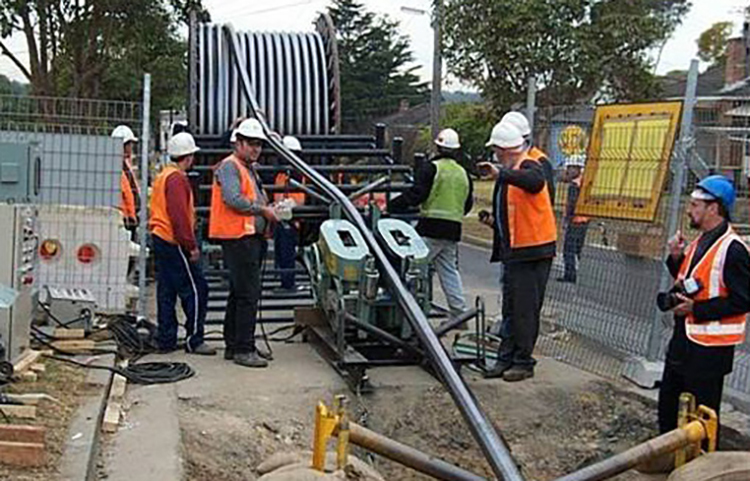 The Metrogrid, or ‘Cable 42 project’ was a critical part of an upgrade to the existing Sydney electricity network to provide for future electricity needs. The project consisted of approximately 24km of 3 x 330kV cables constructed generally through residential areas via direct laid cable trenches. The cable route started at Picnic Point (Southern Sydney) and finished at Sydney Park, Alexandria. A tunnel was constructed by others from Sydney Park to Haymarket (Sydney CBD) in which the remaining 4km of cable was installed. Diona were responsible for the design of cable trench alignment and various specialist methods to cross creeks, arterial roads and railway lines. The trenched component of the project was divided into thirty-six sections ranging from 480m to 800m long (limited by the length of cable practical to be transported on a cable drum and cable installation constraints). During construction of the project a minimum of three sections was open for trench excavation, cable pulling and backfilling/reinstatement. This equated to the management of approximately 3km of open trench through residential streets. The project was completed with no injuries and minimal community impact.